Lin Huang is a wireless security researcher, from Unicorn Team of Qihoo 360, China. Before entering this team, she worked for telecom operator Orange, for 9 years, as a wireless researcher. Her interests include the security issues in wireless communication, especially the cellular network security, and also other problems in ADS-B, GPS, Bluetooth, Wifi, and automotive electronics. She is one of the earliest users of USRP in China, and keeps active in SDR/USRP research and development since 2006. She contributed to several UMTS/LTE soft base station projects, e.g. Open Air Interface. 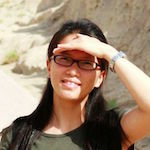 In 2009, She wrote one free e-book for GNU Radio training, which is very popular in China. She was the speaker of DEFCON 23, giving a presentation of ‘Low-cost GPS simulator – GPS spoofing by SDR’.